The UB-Lab 2C from Ubertone allows to perform symmetric bistatic measurements. 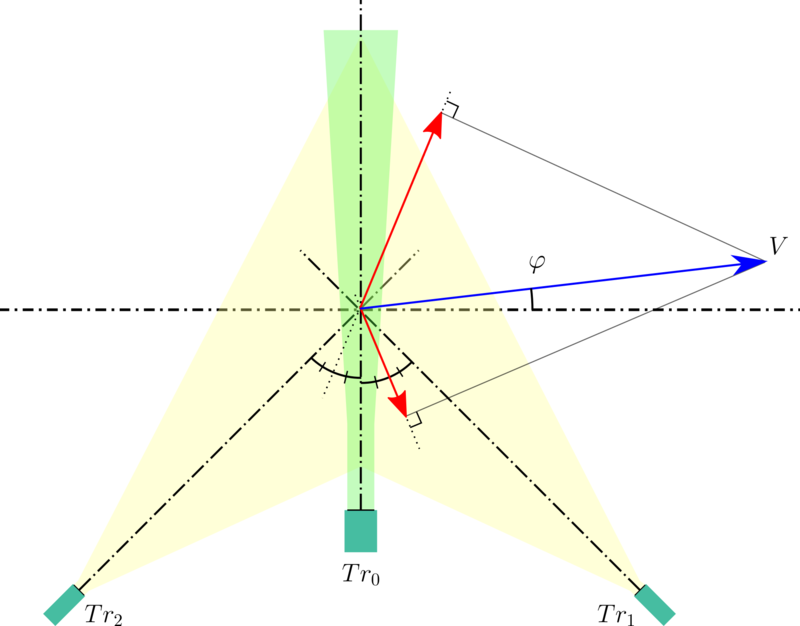 It consists in measuring simultaneously, along a narrow beam, the projection of the velocity vector V over two observation angles. Then, both components of the velocity profile V are computed in the orthonormal coordinate system (x, y). Such a profile is obtained at a high spatial (1.5mm) and temporal resolution (up to 100Hz). The figure above presents an example of installation adapted to the 2C velocity profile measurement in a flow, with three transducers. Tr0 is emitting with a narrow beam. Tr1 and Tr2 are a pair of spreaded beam receivers, located on both sides of the emitter and inclined at an angle α from the emitter’s axis. The transducers are plugged into the UB-Lab 2C profiler. 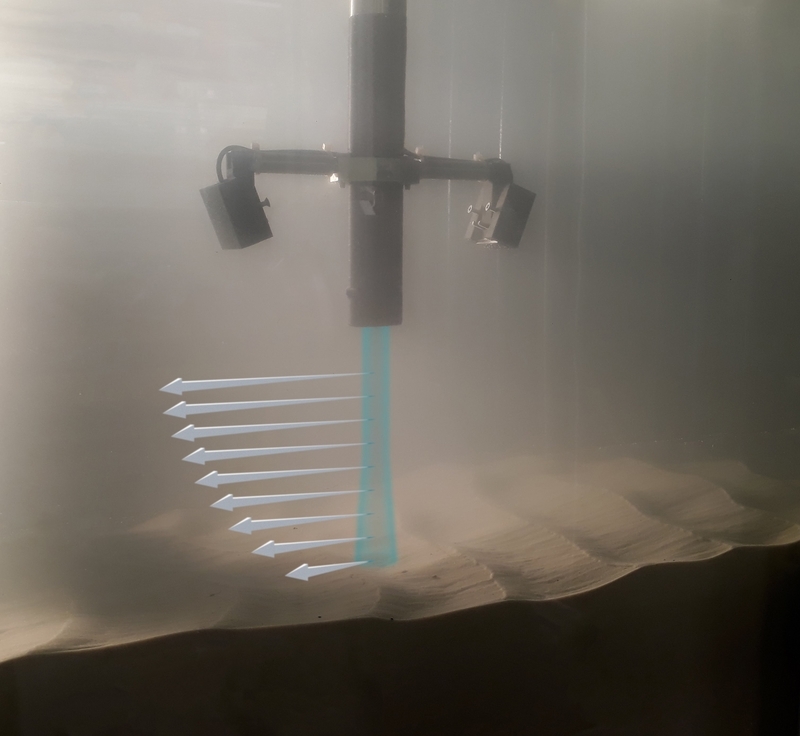 The measurement cells are distributed along the narrow (green) beam constituting the profile. The fluid's velocity \( V \) in one cell, with an angle \( \varphi \) to the main flow direction, can be observed through the projected velocities on the bisectors of the emitters and receiver axes. The norm \( |V| \) and the angle \( \varphi \) of the velocity vector are then computed using trigonometric relations. The triplet of transducers is oriented in a vertical plane, parallel to the main flow direction, to provide the streamwise and vertical flow velocity. To measure the streamwise and lateral flow velocities, the three transducers need to be set in a horizontal plane. By using a second pair of receivers (transducers Tr3 + Tr4), in a plane perpendicular to Tr1 and Tr2, it is possible to obtain the averaged 3 components velocity along the emitted beam axis.